You will be living just as the old-timers did in the 1800s with comfortable modern day upgrades and outhouses as the norm. 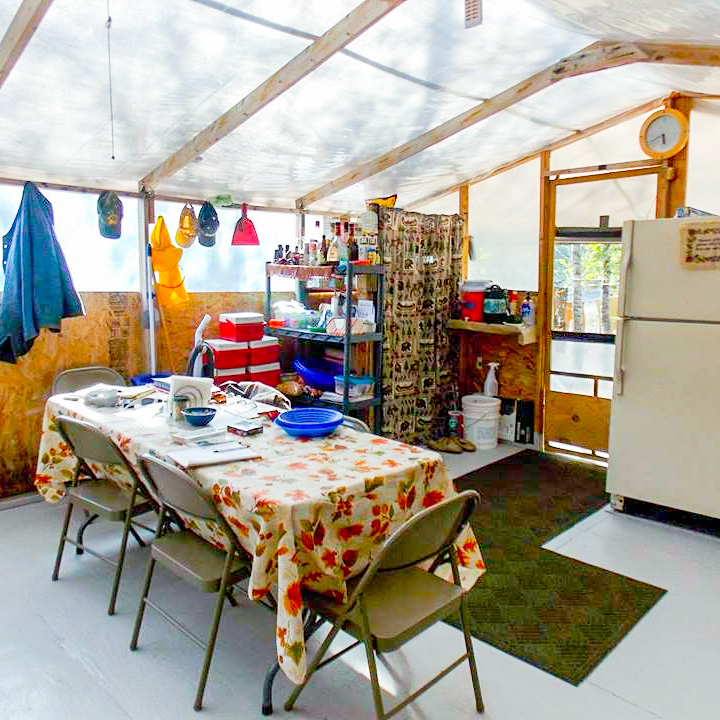 Down river, you will be assigned a wall tent or small hooch, with two people per tent/hooch and propane heater. Couples will be setup in semi-private tents/hooch with a propane heaters. Filtered water will be supplied, hot showers are available in camp, along with a wood fired sauna. We will always have hot coffee and hot water for tea. Iced tea, lemonade and more will be available everyday. We will feed you a warm breakfast (eggs, toast, bacon, hot cereal etc.) every morning and lunch will usually be bagged with a variety of sandwiches, chips, fruit, etc. Dinner will consist of a variety of different items, Steak Night, Pasta Night, Turkey Dinner, Ribs, Burgers and more. We use the GMG Smoker and pride ourselves on tasty, filling meals daily! You have our promise that you will not go hungry. In the middle of the Alaskan Bush, we pride ourselves on quality food! If you have a special diet, please let us know well in advance so we can try to accommodate your needs. Specialty items (soda pop, candy bars, alcoholic beverages, etc.) can be purchased for yourself prior to going down river. We will stop at the grocery store and liquor store on our journey from Fairbanks to Chicken.